Getting the most out of your moving company is important to you. As a business owner, you want your move from one space to another to be a quick and painless process. However, not working with the right moving company can make it anything but. Oftentimes, cheap movers can lead to damaged property as well as belongings. When you work with Harrison’s Moving, you get efficiency and discretion, so that you can carry on, business as usual. With our movers, you can rest assured that we will work quickly but cautiously. We’ll make sure that your employees can effectively complete their tasks or work with customers, while our employees move your things safely. Harrison’s Moving Co works with our very own movers. You can depend on our employees being trained to perform all moving services with the highest quality. Our professionals are extremely flexible, and they always make sure that they can adapt to your every need, as well the external needs as well. We can work around your schedule and other entities, such as utilities and government agencies, so that the process can continually go smoothly. Working with a moving company that takes caution in everything they do is important. Our movers take care of your items and the spaces you’re moving in and out of by using safety precautions. 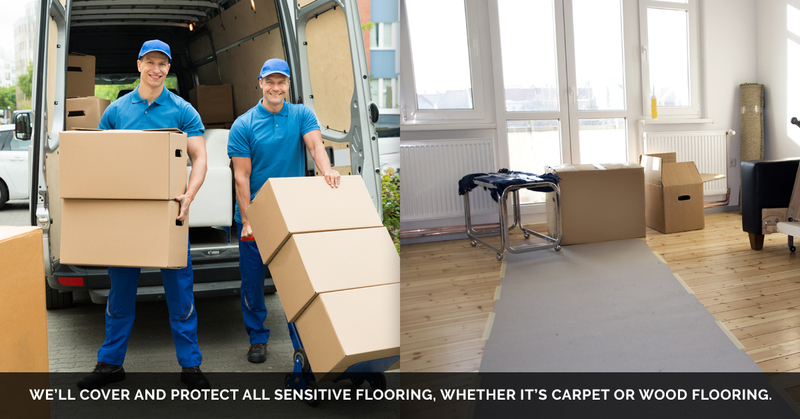 We’ll cover and protect all sensitive flooring, whether it’s carpet or wood flooring. Don’t worry about dents and scratches to your wood floors and avoid dirt and tracks on your carpeting when you hire our movers. We also make sure to protect the walls, doors, and door jams to avoid damage. Disassembly and reassembly of modular units. Your business is growing, and it’s time to move. Having a moving company that you can trust on your side is not only going to simplify the process, but it will enhance the experience. Our company is dedicated to providing business owners with trustworthy and reliable moving services. Business owners can rest easy with they work with the professionals at Harrison’s Moving CO. Our employees are full-time, well-trained and professional in everything that they do. Harrison’s Moving CO. takes pride in providing moving services with integrity. Our commercial movers are efficient, safe, and prompt. You’ll never have to worry about our movers not being on time. If you’re in need of movers for your business, don’t hesitate to call today. You’ll benefit from working with one point of contact that will provide you with a detailed plan and schedule for your move. Call today!